WEISS/MANFREDI has been commissioned by the Department of State to re-envision the iconic embassy compound in New Delhi, India. The new design restores the early modernist Chancery Building and recasts the 28-acre embassy compound into a multi-functional campus. 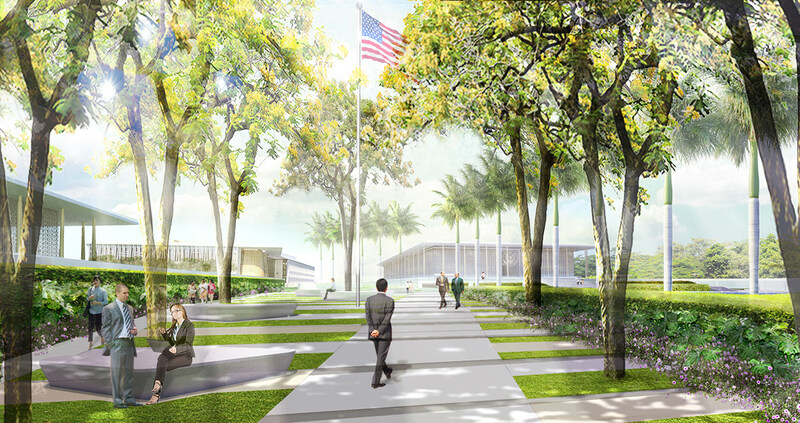 The project includes a new office building, a support annex, and a transformed landscape that will provide a secure campus for America's growing mission to India. A new tree-lined central green offers shade, connects functional zones across the campus, and introduces reciprocal relationships between the buildings and gardens. Inspired by India's enduring tradition of weaving together architecture and landscape, a series of cast stone screens, canopies, and garden walls introduce a resilient integrated design language that brings the campus into the twenty-first century. Nearly sixty years after the opening of the Edward Durell Stone-designed embassy, the rejuvenated embassy compound expresses the symbolic values of American diplomacy through environmental stewardship and gives measure to America's democratic presence in India.